Time for another Chuck Wendig flash fiction challenge. This time, I had to access the @youarecarrying bot on Twitter and acquire a list of items to include in my story. I don’t have Twitter (I’m a Twitter quitter), so I just picked one that another writer received. If we have identical items, fellow writer, that’s why. Also, a facebook folllower suggested a short story featuring a mother-in-law/daughter-in-law relationship, so I included that. I won’t tell you what my items are here. I thought it’d be more fun to make you guess as you read. I’ll tell you what they are at the end. I’ll only tell you there are eight of them. Jaylen set her plate next to the large, brown envelope and picked up her elephant-shaped salt shaker to season her eggs. When the shaker yielded no salt, she shook harder, as if that would magically refill it. She gave up on having salty eggs and replaced the shaker next to its mate, a rhino-inspired pepper shaker. The set was a gift from Eric’s mother, Phyllis. Eric insisted they keep it for his mother to see during her rare visits, though Jaylen suspected Phyllis gave it to her knowing she would hate it. Jaylen turned her attention to the small voice. Dakota stood at the end of the hall and held a long, cardboard tube to her eye like a telescope. The middle of the tube had weakened, and the end of it curved towards the floor. Jaylen doubted her daughter could see anything through it. Dakota put the tube on the floor and climbed into her booster seat. Jaylen walked to the kitchen, retrieved the jug of apple juice from the refrigerator, and filled a sippy cup, which she placed in Dakota’s open hands. Jaylen took another bite of egg as she reclaimed her chair. She lifted the first page of the packet, pretending to read the second page. “We go to her house?” Dakota brought her cup back to her lips. Dakota hadn’t been to her grandmother’s house, and she would likely never go there. She kept drinking her juice, unfazed, having no concept of how a grandmother was supposed to behave. Jaylen scanned the pages. Phyllis’s house was in violation of city ordinance, and she had two weeks from this Friday to clean it or face fines, a court date, or jail time. Even if she did clean, the house could be condemned. Jaylen wanted to move Phyllis into an assisted living facility and gut the house, but Eric insisted on going through everything, maybe because Phyllis shared the report with him. A sense of dread took hold in her gut. She turned the page, wishing they weren’t the only family Phyllis had. The report indicated structural damage. Jaylen lowered the page and sighed. Today’s operation would be a waste of time. Phyllis held a wooden baseball bat and stood in the slightly-open doorway of her house, glaring at Jaylen and Eric. She’d developed a permanent scowl over the years, deepened by her leathery skin. “We’re here to help with the house, remember? Can you let us in?” Eric stepped towards the door. His mother leaned back and clenched her jaw as she looked up at him. She tightened her grip on the bat. Jaylen grew tired of waiting for results. “What’s with the bat? Are you trying to end up in a nursing home?” She pushed past Phyllis and entered the house. Jaylen hadn’t seen it since before Dakota was born. To say conditions had worsened since then would be an understatement. She walked along the thin path carved through the heaps of garbage while scrunching her nose at the odor, a mixture of rotting food and stale cigarette smoke. Everything had a yellow tinge to it – or maybe that was Jaylen’s imagination connecting the smoky smell to the place. She looked back. Eric stood inside the doorway, moving his head and squinting as he scanned the front room. His mother still held the bat but stared at the floor. “So where should we start?” Jaylen asked, half-jokingly. The task before them was impossible. It would take at least two months to clean the house, let alone two weeks. Eric pulled a pair of latex gloves from one back pocket and a roll of garbage bags from the other. Without speaking, he put on the gloves, removed a bag from the roll, shook it open, and began filling it with items from the pile closest to him. Jaylen removed her own gloves and bags from her shoulder bag, mimicking Eric’s behavior. She glanced at them as she worked: Phyllis kept her place, holding the bat and staring at the floor. Eric placed the full bag next to the door and shook out another one. When Eric moved a few feet inside the room, Phyllis walked behind him and removed something from the full bag, hiding it in her hand as she brought it back to the bat. Jaylen nearly called her out but decided against it, knowing one of Phyllis’s outbursts would likely result. Instead, Jaylen kept an eye on Phyllis, watching her remove exactly one item from every bag they filled. She placed the items onto another pile, into the pockets of her sweats, or into her bra. By late that evening, they’d emptied the front room and dining room, leaving only the furniture. 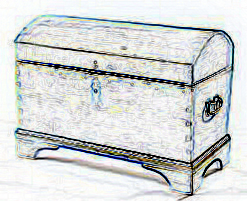 An ottoman-sized wooden chest rested in the corner of the dining room. It wasn’t furniture, so Jaylen figured she could place it with the rest of the garbage to be picked up. She wanted to look inside the chest, on the off-chance there was something valuable in there. She tried to open it, but a lock kept the lid in place. A stomping sound on the wood floor made Jaylen look up. “No. Leave that. Don’t touch it.” Phyllis wedged herself between Jaylen and the chest. “Don’t bother.” Phyllis tromped into the kitchen. In the days that followed, to Jaylen’s surprise, they de-cluttered most of the rest of the house with little confrontation from Phyllis. The locked chest stayed in place in the dining room. Jaylen doubted the inspector would have a problem if it stayed, but she became increasingly curious about its contents as they worked. Eric told her he’d try to open it when he got a chance. On the fifth day of cleaning, Eric convinced Phyllis to go pick up a pizza, leaving him and Jaylen alone in the house. Eric retrieved a screwdriver from the kitchen and walked to the chest. After several minutes of twisting, pulling, and prying, the lock broke, and he lifted the lid. The contents weren’t organized, but the chest wasn’t full. Jaylen removed a dusty leather case and opened it, revealing a small, brass telescope. She held it to her eye. “Dakota would love this.” She replaced the telescope and closed the case. Eric picked pieces of colored glass – or at least they looked like glass – from around the other items. She leaned towards him to get a better look. “This used to be a Faberge egg,” he said. “I broke it when I was a kid.” He swallowed as he looked at the pieces in his open palm. “What are you doing?” Phyllis’s voice joined theirs from the front door. Eric stood and faced her. “Why would you keep this?” He held his hand out to her. Phyllis stomped to Jaylen and shoved the pizza box into her arms before trying to sweep the shards from Eric’s hand, cutting them both. She swore. “I told you to leave this alone!” She picked a piece of glass from her skin. Phyllis left them and walked down the hall; the slamming of her bedroom door echoed through the mostly-empty space. Two days later, Jaylen was loading the dishwasher when a tapping sound came from the front door. She answered it and was surprised to see who stood on her porch. “Can I come in?” Phyllis asked. Unlike her appearance back at the house, she was clean and her clothes looked new. She carried the small, leather case Jaylen had found in the chest. “Oh. Sure.” Jaylen stepped aside. “She’s napping.” Jaylen scrunched her eyebrows. It was rare enough for Phyllis to arrive unannounced, but her inviting Jaylen to conversation bordered on impossible. Jaylen joined her on the couch. Phyllis pulled a silver chain around her neck, and a small, shiny key popped out of her collar. “I’ve worn this for eighteen years, since Eric broke my egg. I couldn’t bear throwing it away, so I locked it in the chest with my grandpa’s Navy stuff.” She sighed as she stared at the key. “I lost a baby, a girl. Eric was too young to remember. His father gave me the egg after it happened.” She closed her eyes. Jaylen blinked in disbelief, remembering the phrase Phyllis often repeated since Dakota’s birth. I didn’t have a daughter like you. Jaylen hadn’t realized they were words of resentment. And now for the items! How did you do? A packet of paper, a jewel-encrusted egg, a tube, a wooden club, a salt shaker, a jug, a shiny key, a sea chest. ← How Do You Find The Time? Yeah, I’m stopping. Somewhere around the time that we discussed earlier, you posts became more teach and less funny. They were still VERY funny on occasion, but that became more of a once in a while thing and less of a reason the blog exists thing. I somehow feel responsible, and I think I gave the reason why earlier. So, since we occasionally use our FB chats to create serious,. writer-oriented blog ideas, use them to create funny blogs again, too. Hell, I’d love to see you put a YOU character into a book, one that’s your snarky sarcastic side. A bit player with that ‘tude could be a big hit with readers, but since it’s part of your skill set (it’s tough to make me laugh and you do), and part of the emotion palate, why not? Put me in a book? Hmm. I do like that having ‘tude is part of my skill set. Now available on Amazon! Click the cover to order.